Do I Really Want a PS4? It took me a long time to jump on the Sony bandwagon. Aside from my grandma (I'll let that sink in) owning an original PlayStation, I didn't have much experience handling the various shapes of the PS controller. In the fall of 2011 I finally decided I would pick up a used PS3 from a local used gaming store along with some classic platformers such as Ratchet and Clank, Sly Cooper and LittleBig Planet. I've had a good time with my PS3, though it is greatly overshadowed by my enormous Nintendo collection and obsession. Until I picked up Puppeteer this last Tuesday I hadn't bought a new physical game for my PS3 in around six months. I had only picked up some indie gems like The Unfinished Swan, and some cheap classics like the original Crash Bandicoot. This summer I watched the PS4 E3 conference with high hopes the next PlayStation would be worth snagging from day one. I mean at the time it was the obvious choice over the Xbox One and after the $400 price point was announced I refreshed my Amazon page for the 600th time and reserved a day one console. BAM. I was in. Day one, baby. I love having new systems. I love to play around with the settings, try out all the new features and just tinker with the system as a whole. But without backwards computability and after only having my PS3 for a little over two years I started to have doubts that I really wanted a PS4 in the first place. Looking over the launch day titles there is one tile that stands out as a first day buy for me. One. That hardly seems like enough. I don't like FPS, sports titles, or dancing games, so what does that leave me with? Just Knack. Heck, even the Wii U's luke warm launch had three games I really wanted to get my mitts on. But then I think about how late in the game I was with the last generation and wonder if I shouldn't jump in right off the bat. Chances are the price of a PS4 won't drop for quite some time, right? So maybe it's better that I get it now and save myself the hassle. Part of me really wants the PS4, but the other part of me says "Why? What exactly are you going to do with it? You're going to have PLENTY to do with your 3DS and Wii U." I will say that IF the PS4 was backwards compatible with PS3 games I would definitely be leaning towards keeping the one I have reserved. But for now I guess I'll just sit and wait for it to arrive. I mean even if it's delivered and sitting unopened in my closet I can always sell it to a friend or on the interwebs. Decisions decisions. 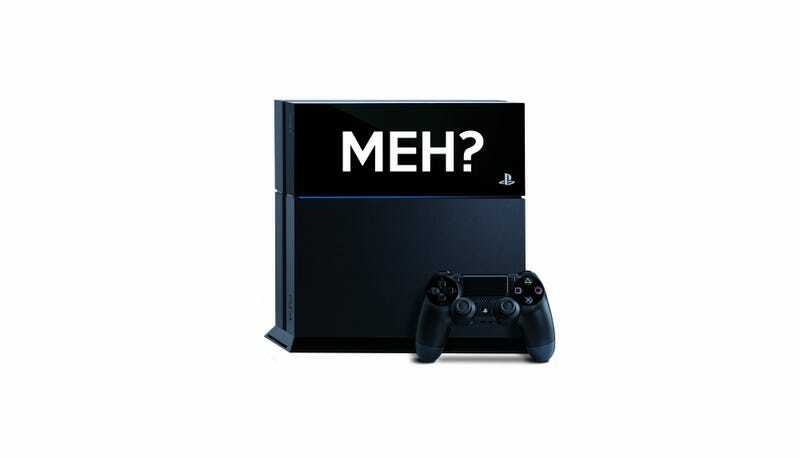 Do you think the PS4 is worth buying on day one?